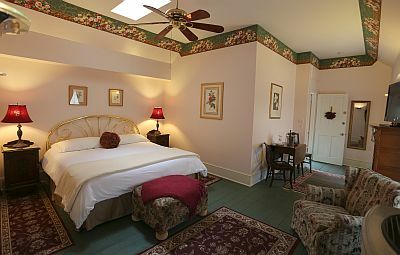 A Romantic, Pet Friendly Bed and Breakfast Near Chincoteague Island on Virginia's Eastern Shore. This is our Garden House. 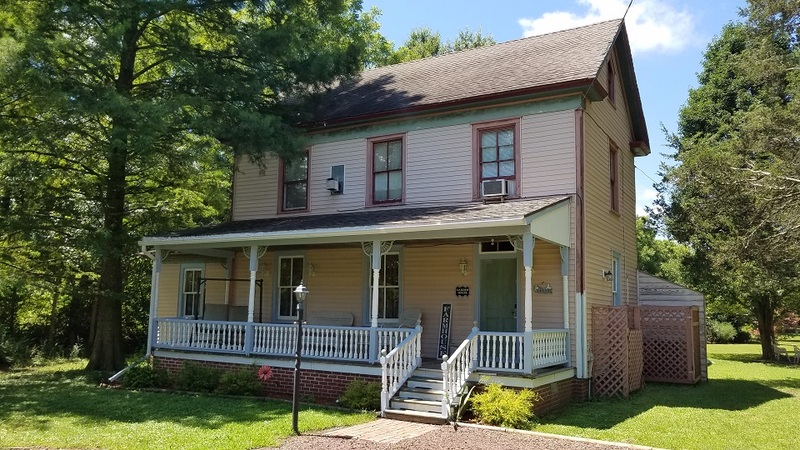 It was originally built around 1870 and was located one block down the road at the intersection Nelson Rd and Depot St. This house was purchased in the 1980s and moved to its presentlocation. High Ceilings and Victorian Flair combined with modern ammenities and cozy fireplaces make every stay a trip into history. Upstairs is our Champagne Room, downstairs our Lighthouse and Sandpiper Rooms, which share a screened in porch. Our main guest parlor with a comfy couch and TV is also located downstairs in this building. Champagne Room is on the upper level of the Garden House. This very private romantic room highlighted by a king-size brass bed, fireplace, sitting area and double whirlpool bath, coffee maker, large flat screen TV, DVD player and refrigerator. Great for anniversaries or special birthdays. We hope to See You Soon! You will love it here!